Major improvements in linear fluorescent lighting are being driven by commercial building energy codes, initiatives in sustainability, customer demands and new regulations. An article published by Craig DiLouie in Electrical Contractor (http://www.ecmag.com/index.cfm?fa=article&articleID=12773) states that commercial building energy codes are getting more restraining and to a greater extent mandate lighting controls i.e. occupancy sensors. ASHRAE/IES (The American Society of Heating, Refrigerating, and Air Conditioning Engineers/Illuminating Engineering Society) 90.1 2010 explicitly covers lamp plus ballast retrofits and new construction. The green building market is one of the few highlights in the construction business. 33% of all new commercial construction projects today are considered to be green, according to McGraw-Hill, a $54 billion market. In the coming five years, the green building market is expected to grow 40-48% or $120–145 billion in new commercial construction and $14–18 billion in major retrofit and renovation projects. Roughly seven out of ten green projects are currently registered with the U.S. Green Building Council’s Leadership in Energy and Environmental Design (LEED) rating system. Retrofits have never been greater, driven largely by legislations like the T12-Pase out, state rebates and the increasing desire to improve profitability by saving money on energy costs. Last year, 46 % of all fluorescent ballast was sold to the retrofit industry, reported by National Electrical Manufacturers Association (NEMA) member companies;, this market has garnered about a 30 percent share in the past. The recent “T12 phase out” government legislation is the most powerful driver in the existing buildings retrofit market. Most magnetic ballasts for T12 lamps are eliminated and while upcoming Department of Energy (DOE) regulations will eliminate the most common T12 lamps starting in July 2012. 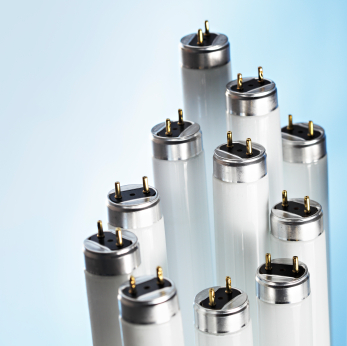 Energy efficiency is perhaps the most important driver in product innovation in linear fluorescent technology. On the lamp side, the big efficiency story is T5. Enough reason for LUXADD™ to design a tailor-made retrofit kit for the US market.